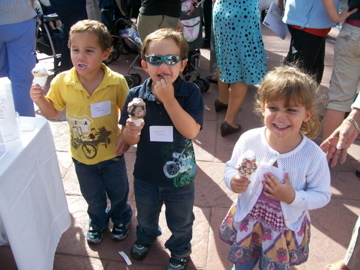 On September 17, 2008, the Regional Neonatal Center at Maria Fareri Children’s Hospital held its 26th Annual Graduate Reunion Party to celebrate their “graduates” and families. There was delicious food, music, clowns, moon bouncers, and other fun activities for all to enjoy. Smiles, laughter, hugs and tears filled this gorgeous fall day. Parents reunited with NICU doctors, nurses and other “graduate” families and shared their stories of survival and success. Members of Hailey’s Hope Foundation had the fortunate pleasure to reunite with many families, meet new families, and exchange heartfelt stories. “We were honored to be a part of this incredibly exciting and special day,” said Donna Zion, Vice President of Hailey’s Hope Foundation. Hailey’s Hope Foundation was proud to contribute a “sweet treat” to this event by sponsoring a Mr. Softee Ice Cream Truck for the families.